Spring may arrive astronomically on the spring equinox, but in Colorado, spring-like weather often comes in dribs and drabs until the beginning of June. And while we may all be eager to get out onto the boats or up into wildflower-carpeted meadows in the high country, this slow start also gives us more time to prepare for the onslaught of pests that return with warm weather. In this week’s blog, we’ll cover some basic steps you can take to keep pests out of your home and business. If you find yourself facing pests despite your best efforts, call Colorado Pest Management for integrated pest management practices that are eco-friendly and very effective against common and uncommon pests. Without a source of food, most pests will go elsewhere. Follow these tips to help avoid pest infestations. Store food in airtight containers. Keep sugar, flour, breakfast cereal, and all other food in containers that do not allow access. Imagine how little space it takes for an ant to get into something. Make sure there is not even this much access to your food. Keep your kitchen crumb-free. This means wiping down the counters after meal preparation and keeping after those who do not automatically do this. Clean out the bottom of your toaster weekly if you have any history of pests. A few crumbs from a toasted bagel can feed a lot of tiny insects. To keep pests out of sheds and garages, make sure things like bird seed are stored in airtight bins as well. A family of mice can live the entire winter out of a bag of bird seed and by mid-summer, they’ll be a village of mice. Sometimes mice will chew through the plastic, but if you check it periodically, the hole will be plenty visible and you can replace the bin. As wasps start waking up from hibernating and buzzing around, you may find yourself filled with terror as you remember a sting from last year or how you fell down when you freaked out when one flew too close (no, wait, that was me). There are a few things you can do to dissuade wasps from establishing nests too near your home. First, watch for the wasps. When you see the first wasps of the season these will be the queens who survive the winter in hibernation. When the temperature warms up, she will emerge and set off to start a new colony. She’ll make a new nest and lay eggs. Queens will not use the nests from the previous year but may build close by, so if you see nests from last year, keep an eye out for new construction. When you first see wasps, put out wasp traps. If you catch the queens, there will be fewer colonies. You can try to trick them with a paper bag. 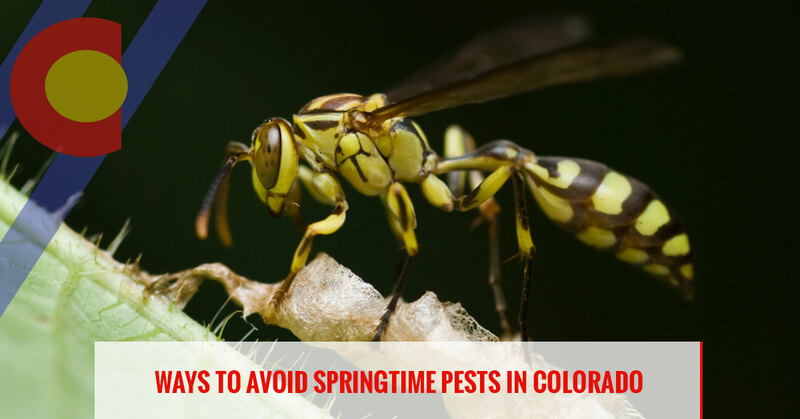 It may sound simplistic but hanging up a puffed-up lunch bag or grocery bag that is tied at the opening to look like a hornet nest can fool other species into going elsewhere because not even nasty wasps will take on the even nastier hornet! Wasps like to build nests in dark spots so pull up those shades in the shed to let the light in! Seal up any holes where they could be getting into garages, sheds, and lofts. Even if wasps are not nesting near your home, they can come for food and water. Try to keep flowering plants away from your doorways so you and go in and out without fear of being stung. Make sure your garbage cans have tight-fitting lids to limit their food sources. We’ll comment on honey bees here because they are often confused with wasps. Honey bees are only considered pests if they from a hive in an inconvenient place, much in the same way a gorgeous flower can be a weed if it’s in the wrong place. Bees are fatter, soft yellow and black, and have hair that makes them appear fuzzy. Wasps are yellow and black and have no hair. They appear shiny. Bees often have clumps of pollen on their legs while wasps never do. Bees do not hibernate but live off of honey over the winter. If enough survive, the hive will split in the springtime and half of them will fly off to form a new hive. When this happens, it is called a swarm and they often rest while looking for a new home. If you see a large clump of bees on your home or trees, call Colorado Pest Management. We have beekeepers on staff and we’ll help the bees get to a new hive without hurting this important species. If you have pests of any kind, call us for Integrated Pest Management. This method of pest control is eco-friendly, logical, and highly effective. Call us today!